A bus has been transformed into an exercising artwork in honour of the fast approaching 2012 London Olympics. 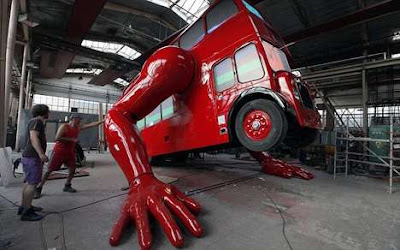 Czech artist David Cerny turned a 1957 London double-decker into a mechanical sculpture capable of doing push-ups. The artwork is accompanied by recordings of a groaning voice and video projections in the windows. You can find the London Booster outside the Czech Olympic House in Islington, so if you’re in London, don’t miss it!! !